Show some personality in your WhatsApp chat! It is now possible to write in italics or bold or cross out words and sentences. You knew that this should have been possible. And now it is. 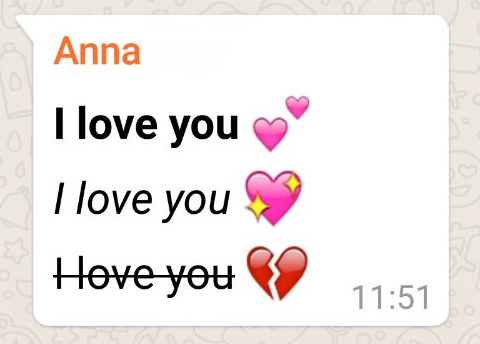 You can put more emphasis on single words or whole sentences in your WhatsApp messages by marking them as italic, bold or crossed out. Or everything combined. Or combined: *_zapptales_*, for example. Or _I love you_, or ~I love you~, or maybe even *~I love you~*.